What kind of Microphone should I buy? This is a question I get very often as a result of my work in the recording department at Long & McQuade Music. It’s a very difficult question to answer definitively because your mic choice can be a very subjective thing. There are, however, a few general guidelines that you may find helpful. First, lets talk (in a basic sense) about some of the different types of microphones that are available and the pros and cons of each. Dynamic mics are probably the most common type of mic you will encounter. You remember that cheap mic that came came with that Wall-Mart karaoke machine you got for christmas one year? Well, that is an example of a dynamic mic (albeit a cheap one) These microphones tend to be less expensive than other alternatives (although this is not a rule). They tend to be a little less sensitive to high frequencies thus, providing a warmer sound. Because of this, they tend not to produce feedback as easily which is helpful if you ever intend to use them in a live situation. Another advantage of the dynamic mic is its ability to handle high sound pressure levels (i.e. LOUD sounds) without fear of damaging the mic. Some examples would be the famous SM57 and SM58 (and Beta58) from Shure. These are industry standard microphones and you’ll find at least 1 or 2 in the mic closet of any self respecting studio owner! What’s better is they only cost between $100 and $180 which puts them within reach of most project studio owners! If the budget is more flexible, have a look at the SM7B (also from Shure). For about $400, this mic is arguably the nicest large diaphragm dynamic mic around! 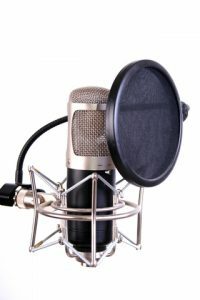 Dynamic mics are typically used on loud sources. Snare drums and guitar cabs are often where you’ll be using them. However don’t be afraid to try them on a vocal or acoustic instrument. Remember: There are no rules. Trust your ears! Condenser mics are what I refer to as the “Desert Island” choice most of the time. Meaning, if I could only have one mic, I would more often than not choose a large diaphragm condenser mic. The reason for this is simple. Condensers tend to be a little more “full range” meaning, they are sensitive to (and therefore capture) a wider range of frequencies than dynamic mics. For example, the breathy aspects of a vocal or the “zing” you get from a fresh set of guitar strings are better captured with these types of microphones. If, however, I want a warmer, darker sound I can simply use EQ to roll off some of those high frequencies. You cannot however, ADD frequencies that were not there to begin with! These mics also tend to have a much higher output and therefor don’t require as much gain from your mic preamp. This is especially beneficial if you have a cheaper mic pre, as most of the “cheapness” is typically heard at the top end of the gain pots travel! Another thing to consider is the fact that condensers require a power source to function. This usually comes in the form of a 48 volt current (referred to as “phantom power”) that is sent to the mic through the mic cable from the preamp you plug into. Occasionally, you’ll see condensers with battery compartments for the power. One potential downside with the condenser is that due to its heightened sensitivity it will pick up more potentially unwanted noise. Common examples of this include computer fan noise or the tv in the next room. This is why people build vocal booths and other types of isolation. Then you can use the sensitive condenser without the fear of any unwanted ambient noise spoiling your performance. The least common of the three types of mics I’ll discuss today is the ribbon microphone. Ribbon mics have a very warm, almost muffled characteristic to them. Where they really perform is in the low midrange of the frequency spectrum. This would be the last microphone type I would purchase as it has a more limited selection of use cases. You will require a very clean and high gain mic pre to get the best out of these mics. However, If you have a great mic pre, these mics can yield a super warm, almost buttery type tone (it’s so hard to describe a sound!). Because of their lovely fat low mid response, these mics can really bring out the heavy “chunk” of a distorted guitar. I use ribbon mics on guitar cabs quite often (especially in tandem with something a little brighter like an SM57). A couple words of caution: Ribbons are physically more sensitive than other mic types and so one should be careful not to blast them to hard with sound. I would never put a ribbon inside a kick drum, for example. Also, as a rule of thumb, NEVER SEND PHANTOM POWER TO A RIBBON MIC! There are some modern ribbons that can take a 48V jolt but don’t risk it! In conclusion I’d say, The best mic for your music production is the one that captures the sound you want to hear! I know that doesn’t sound like very useful advice but, if you know what the different mics do than you’ll be able to make an educated guess and let your ear do the rest!